Meeting for a second time in mid February, Wendy Beamish, James Francom, Theresa Haysom, Paula Saar, and Andrea Wood addressed the question: Will we increase literacy levels if we integrate technology into our Skills Development Centre? As noted in our previous post, success in increasing literacy levels is dependent on systematically organizing the placement of technology in the Skills Development Centre (SDC). Moreover, we are beginning to recognize that how we use technology depends on our own personal experiences with it as educators. During the past first half of the year, we explored what works for our students and what doesn’t, and are coming to view what we are doing in the SDC as rich with potential. However, we must be patient observers as we work with technology in hopes of increasing student literacy. There are numerous variables involved in an inquiry such as ours. Student learning styles and teacher presentation styles are two such factors. Moreover, some students are more responsive to certain teaching styles, and the same can be said for various technologies. In other words, student learning styles may well determine what technological activities students will work with and benefit from. As educators we have tried to be consistent in our approach to teaching in the SDC. While the way we approach working in the SDC is relatively uniform, small differences are appearing in our approaches. Part of this is the result of having little time to collaborate with one another other than during our Inquiry Based Collaborative Meeting times. Also, the classes that we teach vary greatly in composition. One teacher has a class with seven designated students, mostly in Grade Ten, and several other students who could be more focused. When we met in February, we began with these questions: Where are we at? What are we doing as SDC with our classes? What is working? What is not? One teacher reported that she was working on organizational skills and agenda usage. In the past many students recorded their homework assignments in their agendas, but now when we talk to students about recording homework, many of them are using their phones and iPods when their classroom teacher allows it. Some use the notes section on their phones, while others take pictures of the homework on the board their devices. At the same time, some students are still using their agendas and checking them regularly. They carry their agendas with them and prefer to write in them. Differences such as these are to be expected as we shift into the digital world. We are still having students write journals and this has been successful. One teacher is focusing on essay types, transitions, and writing five paragraph essays. This five paragraph essay model is something that all SDC teachers come back to at various times. How is this writing linked to technology? First of all, most students with dysgraphia find that technology allows them to work more on written expression and be free from cursive writing, which interferes with the flow of their writing process. This point is obvious, but should not be forgotten. As for journal writing, we allow students the choice of whether they want to write on paper of whether they want to write on an iPad. Many students still prefer writing on paper and we respect this. Marking the assignments that are typed as documents can be challenging and time consuming for teachers. One teacher found that it was easiest to highlight errors in yellow. Students will go back to these highlighted words and try to correct their work. The same teacher noted that some of the younger students were not using capitals and periods. These would be the weakest students. Other students do not capitalize the personal pronoun “I” because they are used to auto-correct, which they have on their phones. These same students are unlikely to use spell check. All in all, looking at student writing on paper or online is worthwhile. Students tend to make the same types errors over and over again. If we can make them aware of this, we can help them to become better writers. One teacher also is ready to have his students revise a journal and write it on Blogger. During our collaborative time, we discussed applications such as Enchanted Dictionary for Grade 7 – 12, and My Script Calculator. We learned that because Apple has discontinued support for earlier iPad generations (iPad 1s), the operating systems for our iPads will not support several newer apps. While Quizlet is not an application, we are having success with it in the SDC. Matthew Friesen and Namlha Yuthok create Quizlet Dictionaries for students related to their Social Studies and Science books. How have the iPads been used in the SDC? As previously mentioned, they are being used for writing, but what else are they being used for? Some teachers have observed that the iPads have been most commonly used as a research tool, which is good, but it is our hope that they will be used for more than simply a research tool. Teachers are reporting success with Quizlet. Students like Quizlet because it is user friendly and turns their question-answer work into games, making learning fun. Students are also building their own online dictionaries on Quizlet. Most teachers are having students enter five words into Quizlet weekly. If students do not have homework to do during the homework support portion of the SDC block, we often have them work on their Quizlet dictionaries. During January, we used the SDC blog to teach study skills for our exam week. Most students reported using at least one of the strategies we taught, and were able to articulate how they studied. For example, because we did work on exam anxiety through the blog, students were able to identify in their journals the things that stress them about exams. Finally, some of the Grade 10 students found the Ministry of Education online e-exams and practiced writing these on their iPads. 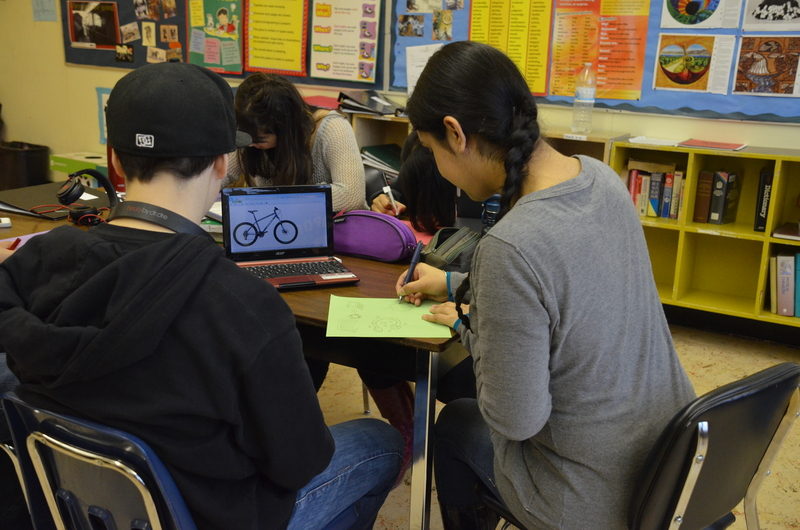 Pictured above, a peer tutor helps a student draw a bicycle from a diagram on an iPad. This falls into the category of using an iPad for research, as well as for fun and visual literacy. 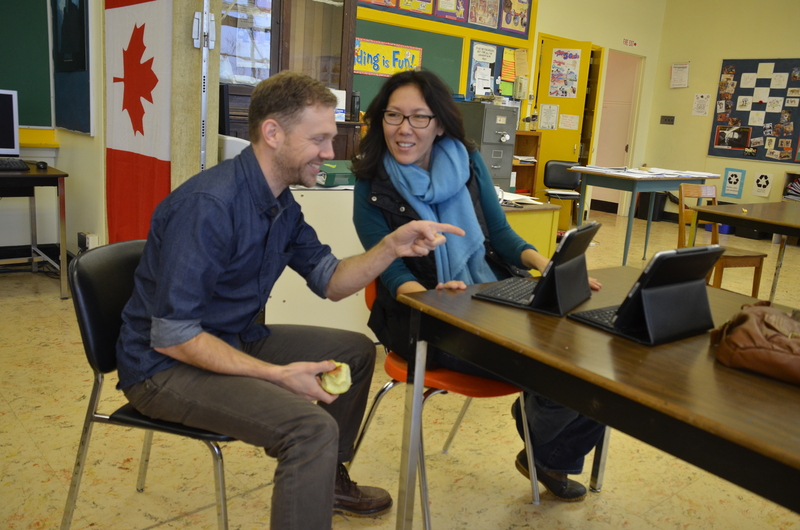 We understand that as educators, each of us is coming to the classroom with a different technology based skill set. Like our students, we must develop our own sense of weaknesses and strengths related to our use of technology. How do we enable students to take inventory of their own weaknesses and strengths using technology, so that they can best meet their own learning needs? To do so would be one of the best things we could do for SDC students. Using technology to increase literacy means enabling students to recognize their own strengths and weaknesses in using technology.